We are spending the week doing repairs among others taking out and repairing the Victron 24/3000/70 inverter/charger that lost it´s charging funktion. The genset has been bled free from air(that I introduced) and a starter fault (low voltage at the starter) has been corrected by changing the ground attachment increasing the voltage at the starter from 7,8v to 12v!? When going through the John deere we found a leaking oilpressure hose that has been changed. Minor electrical issues have been repaired and the watermaker has gotten new membranes (still only producing 15 gallons/hour though-fault research is ongoing). 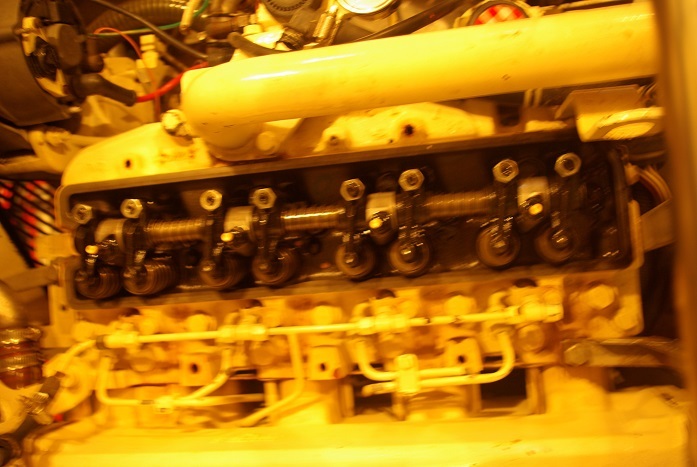 Engine batteries will be replaced to same Optima batteries as genset, and today engine valveadjustment on the J.D was performed as advised every 3000hrs(J.D on DM has 3.400hrs). Oil and fuelfilters will be replaced, and we will go through the Comnav autopilot system,where all spareparts are located,hydraulic steeringsystem etc. On Friday DM will be hauled out for a washdown of bottom and antifouling. When on the hard recaulking of the teakdeck will also be carried out by Tecnical services at the Marina ship yard. Prices for this is reasonable and the knowhow on wood work in Turkey is good.